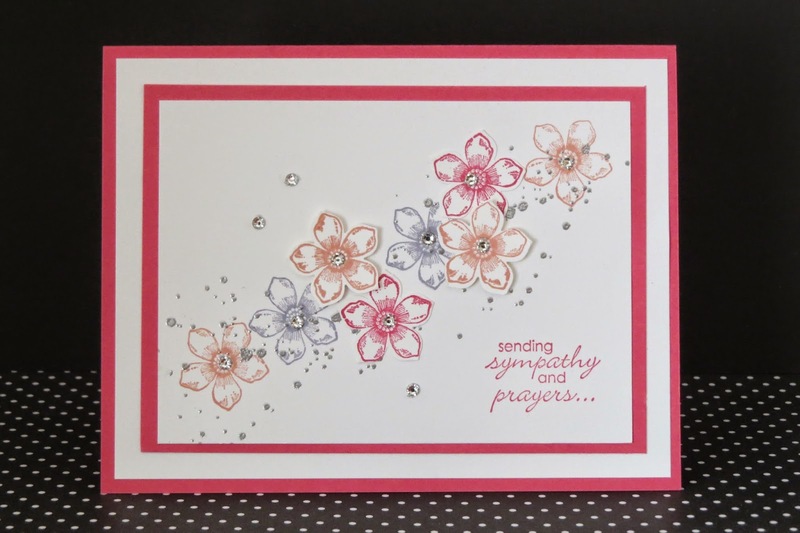 Karina's Kreations: Stamp it My Way Card Challenge! Stamp it My Way Card Challenge! It's stamp it my way card challenge time! Make a card with these pieces and post it here! I'll enter your name into a draw to win a prize. -Whisper White 4" x 5-1/4"
-Strawberry Slush 3-1/2" x 4-3/4"
-Whisper White 3-1/4" x 4-1/2"
I received this cute card as a swap. The colors are Crisp Cantaloupe, Wisteria Wonder and Strawberry Slush. The stamp sets are Petite Petals and Gorgeous Grunge. The gorgeous Grunge image was embossed with Silver embossing powder. Lots of Rhinestones add sparkle to the card.